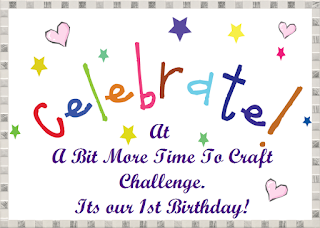 Today is the start of Challenge #25 over at A Bit More Time To Craft. Remember it is their first anniversary this month, and there are 12 prizes to be won! This is my card for the design team, and Lozzy's Golden Dreams paper called my name. then added cog wheel die cuts from gold metallic paper - the large die cut used a Memory Box die, the individual ones used were from a set by Cheery Lynn. The image is Steampunk Girl by Stitchy Bear, and was coloured with Prismacolor pencils. Glossy Accents was added over the watch face on the hat and her spectacle lenses. The cog wheels on the hat, her necklace, and beside her were all coloured with Signo metallic pens. The final detail was to stamp and emboss in copper ep the birthday greeting, cut it using a SB circular die and layered that over a cog wheel die cut. Lovely Steampunk. Thank you for playing along this week at OSAAT. I sure hope to see you back again very soon. Good Luck in the challenge!!! Lovely card. I love Steampunk. Thank you for joining the challenge at Crafting with Dragonflies. Hope to see you again next time. Such a lovely steampunk girl - an awesome card ! Oh, how fun this is!!! Your steampunk girl has pizazz!!! Beautiful card! Lovely card, great design and love all the golden cogs. Thank you for joining our Sparkle challenge this week at Allsorts. Love all the cogs and gears with that cute sassy looking Miss. Precious and so pretty. I like this and I like that it is all golden and shimmery instead of grunge. It's more fun this way! WOW! Maxine, you are so creative! Love this card! What a cool card for a girl!!! I love steampunk and you captured the theme perfectly. Wow, beautiful colored girl to a great geared up background, Maxine. Wow, interesting seeing the same cog wheels as the previous card used in a totally different way. Don't they make a fabulous background!